Dupaco has free checking and a dividend-bearing checking account. The bigger deal is that, no matter where you are in the world, you're never far away from fee-free access to your money, with Dupaco's mobile app and over 5,000 shared branches nationwide. And by using direct deposit, you can skip a trip to the branch by directly depositing your paycheck, pension, or benefit payments to your checking account. You'll need Dupaco's Routing Number, 273974581, to set up direct deposit. When you open a checking account at Dupaco, you can get a free optional MoneyCard debit card. Beginning in March of 2017, Dupaco will begin issuing EMV chip cards to offer our members better fraud protection. To learn more, check out our EMV debit card FAQs. ClickSwitch allows you to move your recurring payments from a non-Dupaco checking to your Dupaco checking online. Contact Dupaco to see how. It's quick. It's easy! Mistakes happen. Maybe you forgot about a withdrawal that you made or accidentally swiped your debit card when you meant to use your credit card. Suddenly there’s not enough money in your checking account to cover a purchase or check payment. When that “oops!” moment happens, we have you covered. We’ll automatically transfer funds between your accounts to cover the shortfall if you link your checking account to another Dupaco account (like a savings account). We’ll temporarily cover the difference for you through our Overdraft Privilege program. If you typically don't carry a large balance in your checking account, you'll want our free checking. But, if you want your money to earn dividends while it's in your checking account, you'll want 1st Rate Checking. See the comparison chart below. 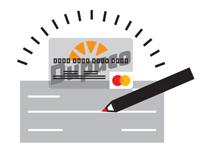 Use your free Dupaco MoneyCard for debit purchases where MasterCard is accepted. The money will be deducted right from your checking account. You won’t pay a service fee or one penny in interest, as long as you do not overdraw your account. Members age 15 and older with a checking account in good standing are eligible for a free Dupaco MoneyCard. Log in to Shine Online Banking. Click on the Check Services tab, then click on Order Checks. Use the dropdown list to select the account for which you'd like to order checks, then click next. A new browser window will open. Follow the prompts given to complete your check order. During normal operating hours, call us at 800-373-7600 / (563) 557-7600, ext. 0. Please have your member number, quantity needed and starting check number ready. Members age 50 or better who have total deposits or total loans of $1,500 or more with Dupaco, who also have direct deposit of pension or Social Security, will receive two free boxes of Dupaco's custom checks each year. They use to show on my Summary but don't see it now. What happen to Pending Purchases that are on debt card but not used pin on? Hi Carolyn, we'll have a member service representative reach out to you and help you locate the pending transactions. Hi I see that it says it takes 7 to 10 business days for my card to arrive. It was ordered on the 10th and shipped out on the 17th. I still haven't received it and no one seems to be able to help me with this situation. I talked to customer service and they said that they can't do anything including placing an order to get another card, as well as calling me a mam the whole time (I can assure you that I do not sound like a girl). I understand that it's Christmas time and all that but I can't even get gifts or anything because of this. Hi Jacob, we're sorry to hear that your card hasn't arrived in a timely manner. Carrie from our card services department will be reaching out to you to see what we can do to get your card in your hands as soon as we can. How long does it take to get your card through the mail? I am going out of town this weekend prefer not to carry cash. Hi Michaele, cards generally take 7-10 business days from when they were ordered to arrive. We'll have someone from our Card Services department reach out to you with an ETA on the card and get a travel alert set. Where do i find access to log into my account on line? I may just be over seeing it. Thank you. Hi Cristina, you can find the login for Shine to the right of the main banner graphic on the homepage of dupaco.com. I have no access to online banking it claims i'm unable to be located when i've been a member for years. is there a reason member numbers aren't working? Hi Sloane, we'll have someone reach out to you here shortly to troubleshoot. Hi Chris, it takes 7-10 business days for cards to arrive once they have been ordered. I have a debit/money card and I just want to make sure that there isn't a certain amount of times I have to use it in a month. Hi Madison, we do not have an minimum usage requirements with our debit cards. have tried numerous times to get into my accounts with no success. never had this problem with the bank I left. Online banking is how I check my accounts. Hi David, we're sorry to hear that you're having trouble logging in. We'll have someone from our Member Service department reach out and help you troubleshoot. I am thinking of switching over to Dupaco for my checking account, for new members do you offer the first box of checks free? Hi Melisa, only our Prime Time members who have direct deposit for social security and/or a pension receive a free box of checks. We will have one of our Member Service Representatives reach out to you. Hi Kate, we will have one of our member service representatives reach out to you about opening a joint account. Hi, I was wondering do I have to go in and get a new debit card when mine expires or do you guys automatically send one out? Hi Nichole, you should receive a new debit card around the beginning of the month that your current one expires. If you don't receive it shortly before your expiration date, please give us a call. Thanks! Hi Lisa, Opt in means that you have chosen to participate in something, and opt out means you have chosen not to participate. Does Dupaco have ATM fee reimbursement? HI Brad, Any transactions done on a Dupaco ATM are free. Dupaco allows you to use non-Dupaco ATMs for 8 transactions per month before we start charging an ATM fee of $0.50 per transaction. If you need an exception made, you can always call our Card Services team at 563-557-7600 / 800-373-7600, extension 201. If I have overdrawn charges,how do I deduct these charges from my share draft balance or make a online payment?? Is it gonna automatically deduct from my checking account?? Hi Torelik, for each item, the charge will be added to your balance. You can transfer funds from another account to make a payment or stop at one of our branches. We are new to the area on ss and pensions, we have some credit issues due to my medical condition of cancer, Do you deny people from opening a local checking and savings because of their bad credit rating? Hello, we will have someone reach out to you. Thanks! Are there any monthly fee with a checking and saving accounts? Hi Shannon, all of our fees can be found under the fees link at the top of the website, next to the search bar. Here, you will find explanations on our fees. The free checking accounts do not have any monthly service charges, but the First Rate checking does if you do not maintain a minimum balance of $5,000. As for savings, every member puts in a $25 share to the credit union (thus, making you an owner!). Otherwise, we do not have monthly service charges. Hi Jessica, we will have someone in touch with you on this since the time that the deposit goes through depends on the amount and how it was deposited (mobile vs. in-branch). Thanks! where can I get a new debit card if mine gets broken? Hi Maddie, you can give Dupaco a call at 800-373-7600 or 563-557-7600, ext. 0, or simply stop into the nearest Dupaco branch, and we will process a new card for you. Why is there not more information about deposits made? Such as whether it was cash or check and whether or not part of the check was cashed and the other part deposited? Can i get this information as it would be helpful for maintaining my records. I am referring to online banking. Hi Melissa, this kind of information can be manually added to your deposit transactions in Shine. Under the Accounts, then Deposits tab, you will find a list of deposit transactions. Under the Actions section to the left of each depost, you can edit the transaction. It is here that you can add any notes that you would like. You can also ask a Teller to add a memo to the transaction at that time. Does free checking also mean the checks are free? Hi Michelle, a box of standard checks with a free checking account is $17. $10 fee if my balance doesn't average 5000..can that go lower? We don't even bring home 5000 a month. The $10 fee only applies to our 1st Rate Checking accounts, in which the $5,000 minimum must be held. The other option would be a Free Checking as these accounts do not require a minimum balance. I attempted to open a checking and savings account at a local bank. They did a credit check on me and discovered I filed for bankruptcy a few years back and therefore were only going to give me a savings account for six months and then re-evaluate the situation. Will I be able to open both with Dupaco if this is the case? Mark, Dupaco is dedicated to looking into our members' personal situations and finding solutions to better their financial picture. Please stop in to any one of our branches or give us a call at 800-373-7600 or 563-557-7600 ext. 0. I was wondering if you still offered custom debit cards where we were allowed to put our own picture on it? Thanks. Hi Lindsey, unfortunately we do not offer that service at this time. Can I chose my own PIN for my debit card or do I have to use the one that was sent to me? Hi Kelly! Yes, you can choose your own PIN. In order to do this, you must first activate your card and then bring it in to any branch with the exception of the Cedar Rapids 4th Avenue branch. How long can your account stay at a zero balance before it is closed on you? Hi Brittany, It all depends on the situation and the account. Why don't you give Dupaco a call and we'll see what we can do for you? (563) 557-7600 / 800-373-7600 ext. 206. I need a pin number....? I got my debit card but I never received any info about a PIN...help? Re: I need a pin number....? Nicole, you should receive your pin number in the next couple of days.